This is the first installment of Stephanie R. Sorensen’s planned “Sakura Steam Series,” which brings readers fully into the conflict between an agrarian Japan that for 250 years sought to purify itself of foreign influences and the inevitable advances revolutionizing the Western world. 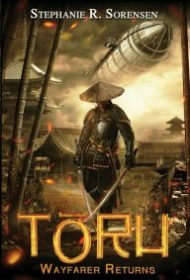 In the beginning of the story, set in the mid-1800s, Tōru spends two years in America, learning everything he can about its 19th century industrial revolution in order to arm his agrarian and insular Japan against technologically advanced enemies gathering on the borders. Then, with a suitcase loaded with his notes and sketches, Tōru sneaks back into Japan, defying a death sentence imposed on anyone who leaves and returns. Readers follow Tōru as he, in a Johnny Appleseed fashion, attempts to spread this know-how around the country. Ingrained opposition to new ideas and technology nearly costs Tōru and his allies their lives as they race to head off the arrival of U.S. Commodore Matthew Perry and his plans to subjugate the country. Skillfully written and packed with details about everything from Japanese forests and battling warlords to dirigibles and sewing machines, Sorensen immerses readers in a compelling and provocative story that intimately describes the struggles of a nation and its people, who find themselves in the throes of cultural upheaval. The book is a mixture of several genres, including historical fiction, alternate history and steampunk. The latter is a form of Victorian-era science fiction in which steam-powered machinery rather than advanced technology rules. As a result of the steampunk elements, some readers might have difficulty suspending their disbelief about the lightning speed in which Tōru spreads industrial change throughout Japan. In just a year, vast networks of railroads and telegraph wires spring up everywhere, without an infrastructure of mines, mills and manufacturing to produce the rails, telegraph wire and other basics. Those not bothered by such details, however, will find an absorbing read. Steampunk fans, in particular, should enjoy the launch of this intriguing saga and look forward to the sequels.